Multiple Camera Monitor is a multi camera surveillance tool that allows users to monitor unlimited cameras both connected to the PC as well as IP cameras. Multiple Camera Monitor is a central point from which you can observe, take pictures, record video and monitor local connected webcams as well as IP Cameras with the ability to pan, zoom, and tilt when supported by the camera. Multiple Camera Monitor supports video capture devices such as USB/PCI cameras and it allows the user to configure the device settings. Multiple Camera Monitor also supports IP Cameras of a wide range of IP Camera manufacturers and models. Plus Multiple Camera Monitor supports automatic discovery of IP cameras, and it supports IP Cameras that support the ONVIF protocol. Most IP Cameras support the ONVIF protocol and Multiple Camera Monitor allows the user to connect to these cameras. Multiple Camera Monitor can also pick up MJPEG and JPEG video streams coming from IP Cameras that do not support the ONVIF protocol. Plus Multiple Camera Monitor allows users to connectdirectly to a URL. 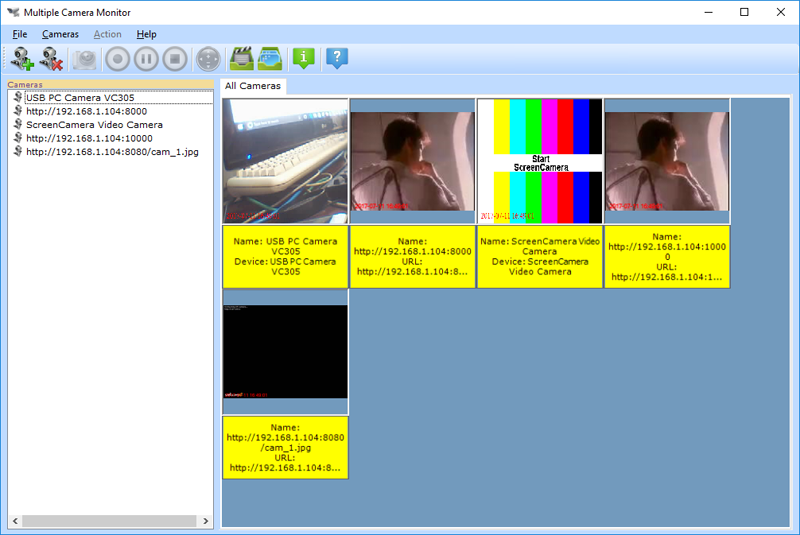 Multiple Camera Monitor allows the user to edit the list of parameters used totry to connect to IP cameras so if the program does not already support a specific model parametrization the user can manually add them and turn Multiple Camera Monitor compatible with new cameras. With Multiple Camera Monitor the user can do surveillance on an unlimitednumber of cameras.